Champagne is one the world’s most traditional and iconic wines, with over 300 years of history and an untouchable status (including the famously litigious Champenoise, who rigorously protect their ‘brand’). And yet, alongside this deep respect for tradition, it is also a surprisingly inventive wine region with new wines appearing regulary, both new growers of Champagne, and new cuvées and styles from established houses. The move to introduce ‘zero dosage’ cuvées is one prime example of a more serious, strategic expansion of the Champagne repertoire that has been followed by most houses. Is some of it just marketing fluff? Well it’s hard to argue that every innovation is about driving quality when we’ve been sold everything from Champagne designed to be poured over ice, to Champagne in miniature bottles designed to be drunk through a straw. 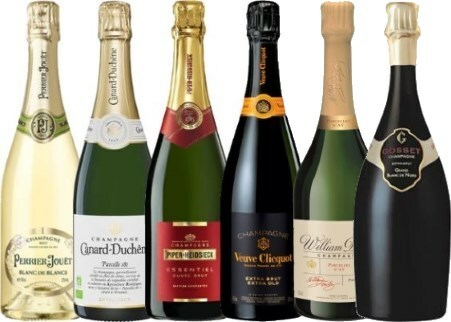 But below is my take on a handful of more serious new Champagne styles launched this year, all from established houses, all of them new products, but some of which have been decades in the making. This tasting includes a hot-off-the-press new release from Champagne Deutz. In fact the tasting note comes from a visit to Deutz two weeks ago, and is a world-wide ‘scoop’, as the Champagne will not officially be unveiled until noon today (5th October 2017). It is Deutz first all-Pinot Noir cuvée, with fruit from two historic vineyards, La Côte Glacière (1.92 hectares) and Meurtet (2.42 hectares), that sit immediately above the 3kms of cellars below Deutz’s fin de siècle mansion in Epernay. Many of the vines are over 45 years old, “producing smaller grapes but with concentrated sugars and excellent ripeness,” according to Cellarmaster Michel Davesne. Currently being shipped by UK importer Gonzalez Byass, the wine will retail at around £95 per bottle. Champagne may be defending its corner in a world awash with new quality sparkling wines, from Sussex to Franciacorta, but it’s good to see that hasn’t stifled creativity. (2017) Partially vinified in oak barrels and blended from 12 hectares of organically certified and cultivated vineyards, this new cuvée is 42% Chardonnay, 36% Pinot Meunier and 21% Pinot Noir with less than 6g/l dosage. It's a fresh and lightweight style, though almost four years on the lees has added some nuttiness and brioche character. But free-flowing and elegant on the palate, it's crisp, lemony and finishes with a lick of pleasing salinity. (2017) Though their prestige cuvée, Belle Epoque, is also an all-Chardonnay wine, a non-vintage Blanc de Blancs is a new addition to Perrier-Jouët's repertoire as of summer 2017. Cellarmaster Hervé Deschamps selected his most elegant and floral Chardonnays for this blend, and it certainly fulfills its brief. From its clear glass bottle the wine pours a very pale colour and opens with fresh, bright floral and summery aromas, a subtle biscuit character, but much more focused on light fruitiness. In the mouth the mousse is crisp and the fruit clean and snappy, an elegant acid framework around cool, quite vivacious fruit. It's a lovely wine and no doubt precisely what Perrier-Jouët intended, but I have to say it feels just a little too simple at its price. (2017) For Deutz, a brand new prestige wine to the Portfolio as of October 2017. It is 100% Pinot Noir from Aÿ, and comes from two vineyards, La Côte which lies immediately above the cellars, and Meurtet. In future single vineyard bottlings from the 2012 vintage will appear from each vineyard as part of the Hommage series. Very nice fruitiness here, a hint of small red berries - cranberry and redcurrant - as well as a real lemony freshness. A touch of creaminess from the lees ageing before lots of bold orange flavour, and again that lovely freshness and elegance that is the hallmark of Deutz. (2017) A fascinating new wine from the rejuvenated Piper-Heidsieck, one of Champagne's hottest names right now. This is effectively a 2011 wine, though not released as a vintage Champagne: the information-packed back label reveals that 84% is from 2011, with 16% reserve wines, that it was bottled in 2012 and disgorged in June 2016. That extra 18 months or so of ageing beyond the regular Brut, plus much lower dosage (5g/l as opposed to 10g/l or so) makes the difference. And what a superb wine it is: a little depth to the colour, then a savoury and salty, instantly gastronomic set of aromas, linear white fruits, lots of nutty notes of development, but lovely clarity. In the mouth it combines a fairly magical marriage of creamy expansiveness, almond and ripe stone fruits, with a searing mineral and citrus core, the low dosage helping propel that saline, ozone-freshness of the finish. Terrific and well priced. This wine will mainly be in restaurants, but some high end retailers will also carry it. (2017) Made from 100% reserve wines, this first release is a blend of six years: 2010, 2009, 2008, 2006, 1996 and 1988. The dosage is just 3g/l and the blend is 50% Pinot Noir, around 33% Chardonnay and the rest Pinot Meunier. Lovely hint of age, a gentle meat and smoke, vinous, with creaminess of texture, the palate dense and long, very vinous again, almost like an aged white Burgundy. I detected a lower pressure in this wine and indeed it is confirmed that it is bottle at just 4.5 bars rather than 6 bars for the yellow label. There is peachiness and lemon zest delicacy, but it is a fine, rounded food wine.